Thrills, chills, spills, spectacular carshes, red flag pitting drama, and incredible racing!! We had it all. The long course was tricky but lots of fun, there was plenty of racing action, and a little bit of “rubbing” going on. Thanks to all who attended including a number of members of the Milwaukee MINIs club, and the Chicagoland MG club. Looking forward to doing this again soon. Several people were taking pictures and video.. Please e-mail me the location of anything that you put out to the web, and I will link them in here. The Badger Bimmers Wisconsin Chapter of the BMWCCA have invited the Chicago MINI Motoring Club to join them for Indoor Go-Karting located in Buffalo Grove, Il on Sunday December 31st.. The format will be a 1 hour enduro with 2 person teams. Cost is $100 per person. There are a few spots still open. Meet at 8:30am, orientation is at 9:00 and the race starts at 10:00. The Chicago MINI Motoring Club can receive a group buy discount on the NorthAmericanMotoring 2007 Calendar. The 2006 Holiday party was a huge success. Lots of food, friends, and MINIs !! Big thanks to Knauz MINI, Patrick MINI and Bill Jacobs MINI for their support and for supplying lots of great give-aways, and to Blake for bringing the very cool Lexan license plate covers!! Thanks also to Taylor for offering up the use of his beautiful house, and to Lori for cooking up lots of pasta. WRAPUP: A Way Motor Works Mod party is a great way to spend a cold snowy December Saturday!! 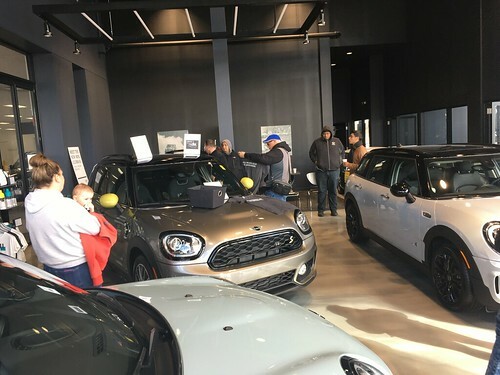 A bunch of MINI’s braved the cold weather and bumpy snow covered roads to hang out for the day in a warm spacious professionally setup garage/shop. Waylen spent a light day installing an intake, Angel eyes, an under strut system, oil change, strut tower reinforcement plate, IPod adapter and more, as well as sharing racing stories, tuning and mantenance tips, and even a small practical joke (sorry Blake).. Huge thanks to Waylen for hauling out to Chicagoland, and club member Blake for providing a fantastic working environment. If you missed out this time and wanted some (or more) work done don’t worry, because we are hoping to get Waylen back sometime this spring or summer for another day.